“Bass Shock” by MC Shureshock Out 24/10/14 on Klub Kids Records. 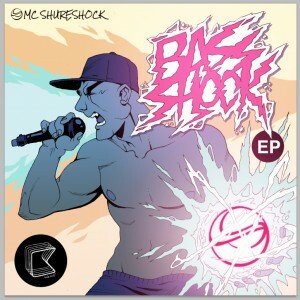 After gigging and producing with label boss Kid Kenobi for almost 15 years – an infamous partnership that has taken them to every corner of the earth via some of the worlds best clubs and festivals (not to mention some of the worlds biggest hangovers) – MC Shureshock at long last releases his debut E.P on the label! With a history of firsts already under his belt, we can proudly say that MC Shureshock is also the first vocalist to release a solo E.P on Klub Kids! But he’s not coming alone! To help bring forth the bass shock Shureshock has enlisted the talents of some bro’s and some of the labels heavyweights. First up steps Kid Kenobi, teaming up with our main man for the single ‘Rize Up’, a super dope ragga house tune that managed to make it’s way all the way up to #17 on the Australian (ARIA) Club Chart! Bo! Next up steps man of the year Spenda C who brings forth a killer ravey ragga trap bomb called called ‘Nu Clear’! BOOM! Third in line comes Phetsta who delivers an immense drumstep tune for the vocals of not only MC Shureshock but also guest vocalist – and ‘King of The Dubs’ – Tiki Taane (Shapeshifter / Salmonella Dub). Together they bring forth one of the most banging and catchy bass tunes you’ve heard in a very long time. DOPE! Next up steps Karton for a delicious future drum and bass / dubstep workout and lastly Perth legend Greg Packer for a super dope junglist bomb! Right then, who’s ready for a bass shock? MC Shureshock and Klub Kids ! !